ToFS is the best place I've found for these; head to the 2nd floor, clear, loot. I get 9-12 per clear. All in all it wasn't a bad run. An average of 6 per pull isn't too shabby since there is minimal running around. Had this drop off of both finicky flowers and baleful blossoms in Stone Hive. there's a lot of spiritists here. Drops like candy off a ghostly student, Tower of frozen shadow. Librarian assistant, a ghostly scholar, and ghostly teacher also. A Ry'Gorr oracle, Crystal Caverns. Dropped off of Meldrath the Malignant in Steamfont Mtns. Dropped a couple times from "an accursed lookout" at the Ruined Tower in Blightfire Moors. 70 in about 2 1/2 hours just running around the tower killing. 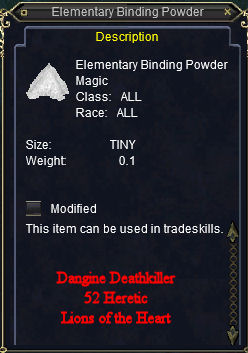 Also drops from Stone Hive Laborer and Gardeners in Blightfire Moors. What was the exact name of the mob?